Son of the painter Luigi, Salvatore Fergola dedicated himself primarily to the study of humanities and architecture, then later to painting. He based his views on the example of J. P. Hackert, attaining great success at the Bourbon court. Francis I of Bourbon requested that the artist accompany him on numerous voyages in order to document them in his paintings. 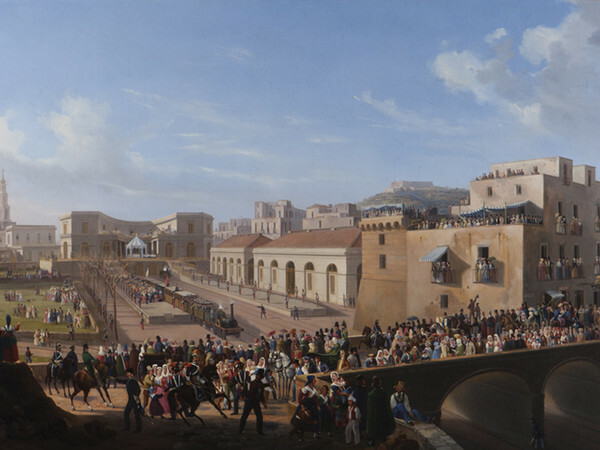 In 1827 he was appointed honorary professor at the Royal Institute of Fine Arts in Naples and in the role of "Landscape Artist to the Royal House", he painted countless official ceremonies and paintings of celebrated historical figures, including: The first suspension bridge of "Real Ferdinando", The inauguration of the Naples-Portici railway and The tournament held by Ferdinand II in front of the Palace of Caserta. From 1843 onwards, his activity notably moved away from the Hackert style and approached new themes: seas by night or in storms, sacred subjects and historic landscapes.